Mega Sale! Free Shipping Included! Save 24% on the BINGER Men’s Chronograph Quartz Watches Arabic Numbers with Date Analog Display and Stainless Steel Band & Leather Strap (Black) by Binger at Watches Sales. MPN: 9202B. Hurry! Limited time offer. Offer valid only while supplies last. ★ Japanese quartz movement FOR precise timekeeping with calendar display. ★ Scratch - resistant mineral crystal lens, Water resistant 316L stainless steel case. 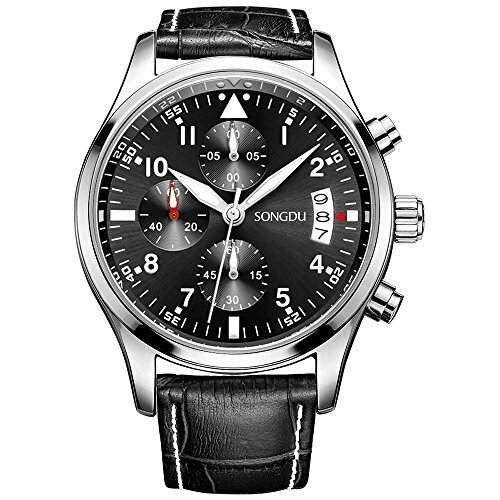 ★ Analog casual chronograph design and classic fine breathable leather strap provide great wearing experience. ★ Water resistant 3ATM: suitable for daily use, splash / rain resistant. NOT suitable for diving, swimming, snorkeling, water-related work. ★ 30 Days money back guarantee; 1 year Warranty; Great customer service within 12 hours. If you have any questions about this product by Binger, contact us by completing and submitting the form below. If you are looking for a specif part number, please include it with your message.